Our Beautiful Blessings! 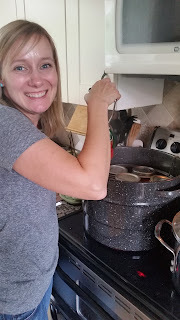 : Canning & Dehydrating! The day after we got back from our road trip to Ritzville the kids and I spent the afternoon at Kim's house. The kids played and played while Kim and I worked and worked. 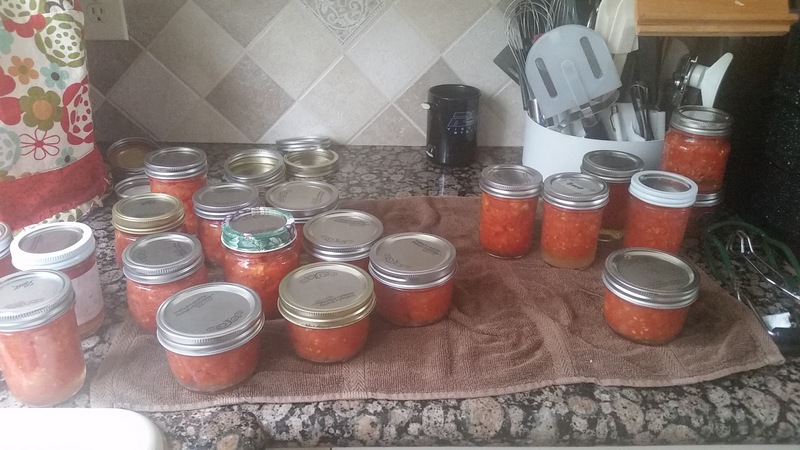 We really wanted to get some tomatoes canned again this year. Unfortunately due to a mistake....tomatoes don't like bleach water so some of Kim's tomato plants didn't make it. Kim ended up having to buy some tomatoes. My tomato plants didn't do the best this year either, but I did have two bowls of tomatoes from my garden so in all we were able to fill 20 jars. Kim and I kind of have an unspoken system down. 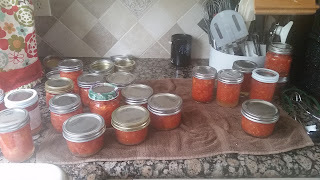 I wash the tomatoes, she blanches them, I peel them and dice them, she filled the jars and then processes them. It all works out really nicely. 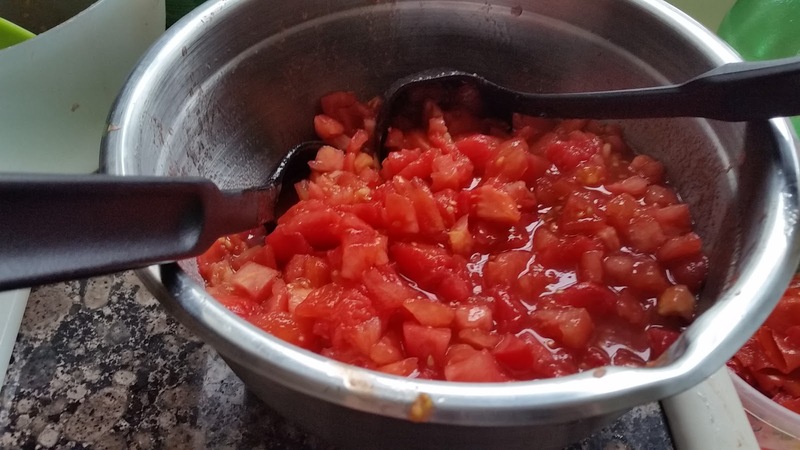 Yummy fresh diced tomatoes! Next year I hope we both have an amazing tomato year because I really want to make spaghetti sauce and salsa as well as diced tomatoes. Here's our lovely jars all ready! My neighbor gave us more plums this year so I had to figured out what to do with them all. I dehydrated one batch, but the kids don't really like them and I can only eat so many. I really wanted to figure out what to do with them where the kids would eat them. That's when I decided to make homemade fruit leather! I found a recipe on pinterest and followed it. After making a couple batches and reading other blogs I decided that I didn't like using parchment paper so I used my silicone mats instead. 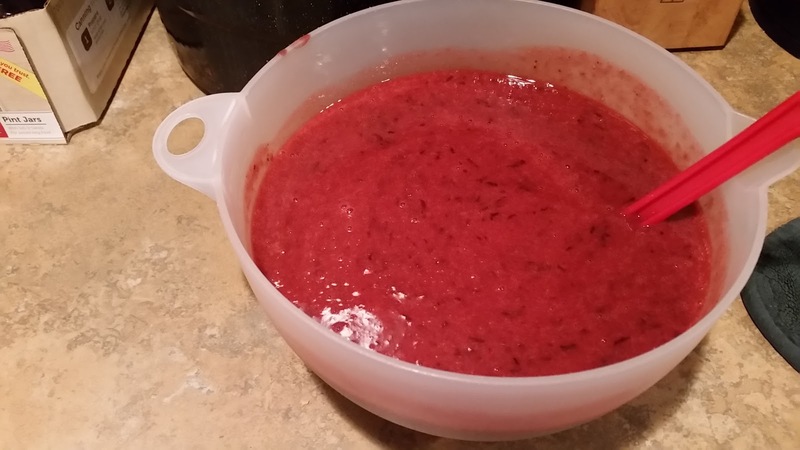 I was able to get the mixture much more level by doing that. I also realized that I needed to take them out of the oven sooner than the first recipe called for. 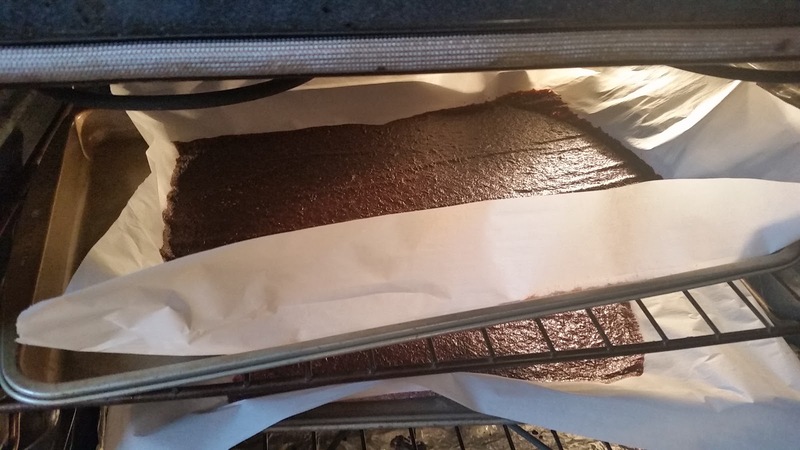 The first couple batches are more like fruit crisps than fruit leather, but they still taste great! 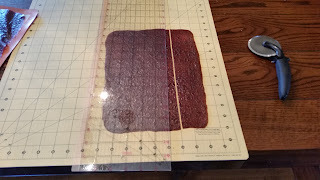 I ended up using my cutting mat that I use for sewing projects to cut the fruit leather into strips. That strip above I cut into thirds. At first I was going to wrap them in parchment paper, but tape doesn't stick to parchment paper so they weren't staying wrapped. I decided to just put them in snack size baggies instead. I buy the baggies at The Dollar Tree and get 50 for a buck so it's really inexpensive. 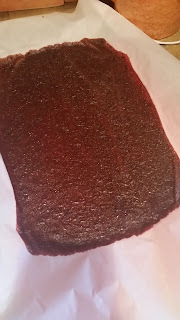 In addition to plum fruit leather I also made apple pear cinnamon and then peach. I ended up with a total of 88 fruit leathers. 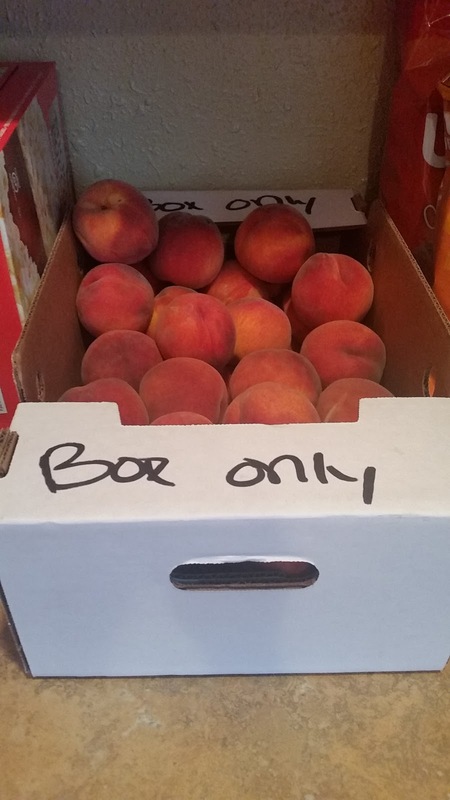 The plums, apples and pears were free from my neighbors yard and I used 5 peaches that cost $3.25 and then the baggies cost $1.50 since I didn't use two whole boxes. 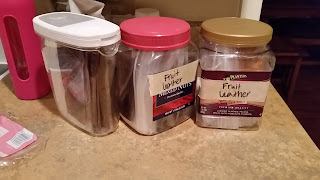 So for a total of $4.75 I got 88 fruit leathers. At Costco you get 48 for over $11! I love saving money!!! Our neighbor didn't tell us we could pick his apples until they were almost done for the year so next year we are going to get out there and pick tons! I'll get to make even more apple cinnamon fruit leather. It's so worth the time and effort if you can get the fruit for free!!! Speaking of peaches on our road trip back from Eastern Washington my mom and I stopped at 3 different fruit stands and then finally bought these peaches. They ended up being the most expensive at $24.99 a box....it's a long story and was seriously the icing on the cake of the cursed road trip. 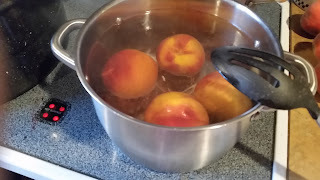 They were awesome peaches though so totally worth it in the end! A friend of mine on FB had posted how she canned peaches and I thought that would be so much fun. 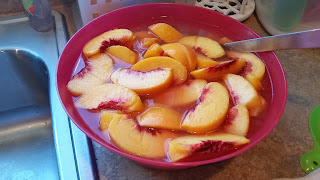 I really hate that Costco doesn't sell peaches in the cans anymore. They sell them in the quart size jars, but there are only 6 jars and they are super expensive. I don't want quart size jars I want pints. So I decided to take matters into my own hands! soaked them in a lemon juice/water mixture. 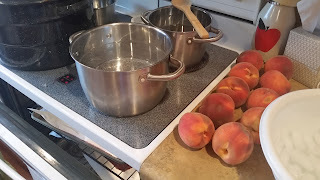 Then I put the peaches in the jars and processed them. 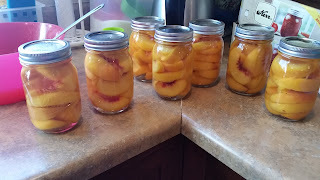 In all I used 33 peaches and got 32 pint size jars full of yummy fresh peaches! And I still have 5 big zucchini's on my counter, a bowl full of plums and a few apples and pears lefts. I better get back to work stocking up our freezer! Ella's First Day Of Kindergarten 2.0! Meet And Greet & Back To School Bash! Owen & Jack's First Day Of School!